The town of Penzance is named "Pen Sans" in the ancient Cornish language, meaning "Holy Headland", referring to the headland to the western side of the harbour on which a chapel was established by early Christians well over 1000 years ago. Today St Mary's Church (seen behind the harbour) is located close to the same site. Penzance is the leading town of the district of Penwith, or the Lands End Peninsula, and has the only seashore promenade in Cornwall extending from the harbour towards the fishing port of Newlyn - a mile or so to the west. The harbour is a centre of activity at all times with both a tidal section and a protected "floating" harbour. The main tidal harbour is filled with moored yachts and other pleasure craft where racing dinghies and cruising yachts compete regularly during the summer. The Isles of Scilly ferry sails regularly from here to the Islands during the summer while a cargo ship provides service to the Islanders for their needs all year round. Beside the harbour is the National Lighthouse Museum which allows the public to see and learn a little of the vital and hazardous work performed by the Lighthouse Service in the protection of our shipping and our shores. Next to the Museum is the Penzance Dry Dock, which carries out repairs and maintenance on a variety of shipping and fishing boats. The town centre, set back a short distance from the harbour, is the focus of commercial activity for the whole Lands End Peninsula, and contains a number of interesting and historic sites. The Market House, set at the meeting point of the major streets of the town, looks down on a commemorative statue of Sir Humphry Davy - one of the town's most famous sons - who, born and brought up in Penzance in a house only a few yards away from his statue, was the inventor of the miner's safety lamp which bears his name today and which resulted in a major step forward in safety in coal mining throughout the country. His statue looks down Market Jew Street, which is the main shopping street of the town. This street is named from the Cornish "Marghas Yow", meaning "Thursday Market". Leading from the Market House to the harbour is Chapel Street which is the most historic area of the town containing many interesting houses. The street readily brings to mind memories of ancient mariners, smugglers and pirates. On the street will be found the Union Hotel where, in the old town meeting rooms, the news of Lord Nelson's victory at the battle of Trafalgar was first announced, the strange facade of the Egyptian House, the Turk's Head Inn believed to be the oldest public house in Penzance and the famous Admiral Benbow Inn and Restaurant, containing a wealth of nautical relics from the coasts nearby. Penzance, favoured by a very mild climate, is famed for its flowers and a profusion of sub-tropical plants and trees will be found in the town's Morrab Gardens amidst an area of Regency and Georgian terraces and houses. 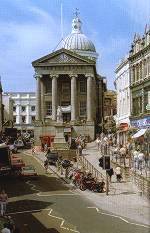 Close by is the Penzance Museum and Art Gallery which houses one of the largest collections of paintings by the famed Newlyn School of artists.